The Isle of Anglesey boasts a wealth of unusual megalithic structures. Bryn Celli Ddu is a Neolithic burial chamber, referred to in Welsh as a cromlech and is situated a few miles to the south east of the village of Llanddaniel Fab. Its name translates as 'the mound in the dark grove'. The chamber itself, one of Wales' most famous ancient monuments, has been dated to around 2,000 B.C., but the history of the site dates back a further thousand years. A henge that contained a central stone circle was constructed on the site in around 3,000 B.C. Its a central area had a diameter of about 20m, and this was surrounded by a 2m deep flat-bottomed ditch that was about 5m wide. Evidence of 14 large stones has been found but a gap at the east indicates there could have been three more. An archaeological excavation of the site in 1928 unearthed a pit at the centre of the henge in which a fire had been set, over which a stone slab had been laid with a human ear-bone beneath. A stone with wave and spiral designs was also discovered near to the pit. The pattern of the carvings bears similarities to the carvings at Barclodiad-y-Gawres and to carvings found in some Irish Passage Graves. The henge was demolished in the early Bronze Age when an archetypal passage grave was built over the top of its centre. A carved stone with a twisting, serpentine design stood in the burial chamber. It is now housed in the National Museum of Wales and replaced with a replica which can be seen outside. The earth barrow covering the grave is a twentieth century restoration, the original mound was probably far larger. 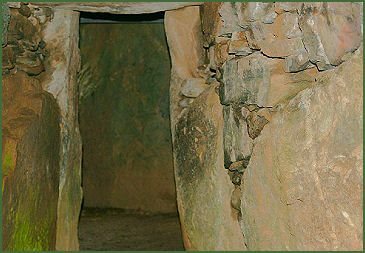 The passage tomb is one of the finest of its kind in Wales. The tomb, which now covers the first monument to occupy the site, comprises an outer circular stone kerb of around 26 metres in diameter, with an inner stone arc, both of which encircle a simple passage tomb, the entrance lies on the east side. It was probably one of the last megalithic tombs to be built on Anglesey. 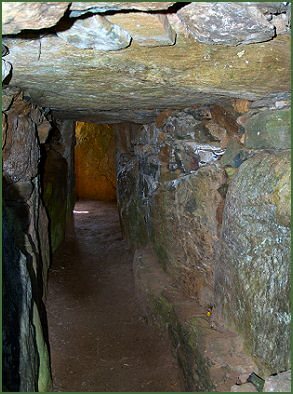 The passage measures around 8.5 metres long and about 1 metre wide, only the last 5 metres were covered with a roof, leaving the outer 3.5 metres open, the division is marked by two large portal stones which originally supported a lintel. This leads to a higher, polygonal burial chamber which is constructed from six large side slabs which are covered with two large capstones. A low shelf runs along the northern side of the passage. A carving in the form of a spiral, probably dating from the Neolithic era, may be seen on on the southeast wall slab. The remains of an ox were found in the triangular stone-defined structure outside of the passage entrance. A solar alignment on midsummer sunrise, first postulated by Sir Norman Lockyer in 1909, was finally proven and documented by Dr Steve Burrow of the National Museum Wales in 2005. 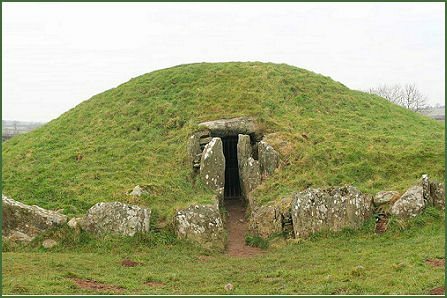 An alignment links Bryn Celli Ddu to a handful of other sites, including Maes Howe and Newgrange, both of which point to the midwinter solstice. The site was was plundered in about 1699. It has attracted the interest of archaeologists since the eighteenth century. It was finally fully excavated and repaired in 1927-1931 by W J Hemp . On crossing the bridge over the Menai Straight on to Anglesey turn left toward Llanfairpwllgwyngyllgogerychwyrndrobwllllantysiliogogogoch, continue along the A4080 for around 2 miles and turn right at the first crossroads. The tomb is signposted and a car park is provided for visitors. A path leads across the fields to the chamber.